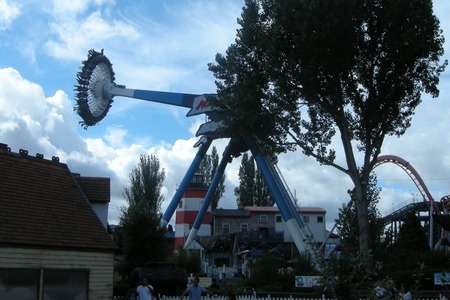 As my children are big fans of Thomas The Tank Engine we have visited Thomas Land at Drayton Manor on several occasions. There is so much to do within Thomas Land that we do not normally have much time to spend exploring the rest of Drayton Manor theme park. We’d been looking for an opportunity to get our tent out this year and in the end we decided to go camping at Drayton Manor which allowed us to spend two consecutive days at the park. I phoned the park in advance to see if it was possible to book a pitch. It was not, but as it was out of season it was very unlikely for their to be a problem with availability. If it was peak season then I would much prefer to be able to book in advance rather than turn up and hope for the best. The only other site I know that is nearby is Kingsbury Water Park Camping and Caravanning Club site. I have visited but never stayed at the Kingsbury Water Park site before. We paid the site fees at the security office on the way in and parked at the camp-site. We didn’t initially put up the tent, instead going into the park first and returning to pitch the tent at lunchtime. We walked into the park from the camp site. The campsite is very good. The field is level with good access roads and the grass in excellent condition. There is a modern log-effect toilet and shower block. There is a baby changing area, but it is not in the shower / toilet areas which may have been more convenient when I showered my son; with hindsight it may have been better to have taken pull-ups rather than nappies for a toddler as that would have made it easier to dress him after the shower. There is also an indoor dish-washing room with two very large sinks. 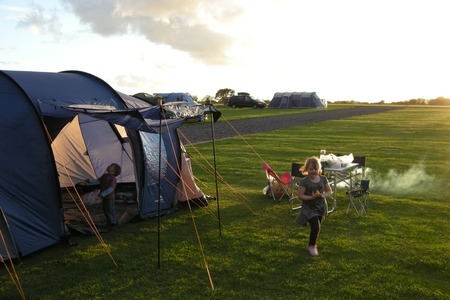 The campsite is everything I would expect for the price and in excellent condition. One thing that would have improved it would be to include a children’s play area, but that is something that is more often found at larger, more expensive sites. There are three entrances to the park, although only two of these are open on some days. The nearest is entrance 2 which is close to the camp site. It is only open when the site is busy and the alternative car park is open. It was closed on our first day at the park (when it would have been more convenient), but the second day the park was much busier and was open. This entrance is at a midpoint in the park near the Drayton Queen boat and Buffalo roller coaster. The next entrance is by the conference suite reached by walking back up the hill towards the road (about 5 minutes walk). It is also the entrance used by those arriving by coache. This was the first entrance we went to and it would have been fine except that they didn’t have our tickets. The weekend that we went happened to be a special charity weekend for the Birmingham Children’s Hospital. We had bought some of our tickets from the hospital’s online shop and as such they had to be collected from the main entrance. Other tickets such as Tesco club card vouchers could still be exchanged at any entrance ticket booth, it was just these special charity tickets that had to be collected separately. The main entrance is at the opposite end of the site to the entrance we tried and is a long walk. It would have been better to take the car. After entering through the main entrance the entrance to Thomas Land is immediately on the left. There is no reduction on admission fee for staying at the camp site, but a second day at Drayton Manor is available for only £12 per person when purchased from the Guest Services office near the RNLI shop in the centre of the park. This made a second day at the site excellent value. 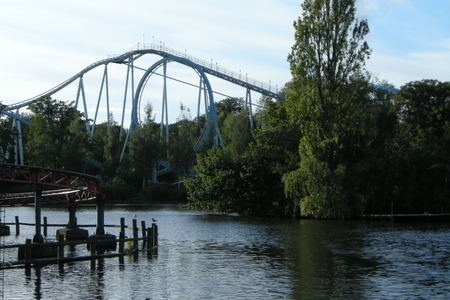 Having two days at Drayton Manor is much better than one, but it still isn’t long enough. It would be plenty of time to just spend in Thomas Land, or to just go on the adult rides, but when you try and do both along with the family rides as well as the zoo and the new dinosaur trail then we could have done with a little longer. We had a great two days and it was long enough for us as a family, but there were a few areas I would have liked to have spent more time at. One of the difficult things as a parent that loves the adrenaline rush of the big rides is in trying to go on the rides without spending too long away from my family. Fortunately the queues to the adult rides were very short (Thomas Land was more popular, especially the Troublesome Trucks ride), so I was able to go on G-Force, Shockwave and Apocalypse without abandoning my family for too long. 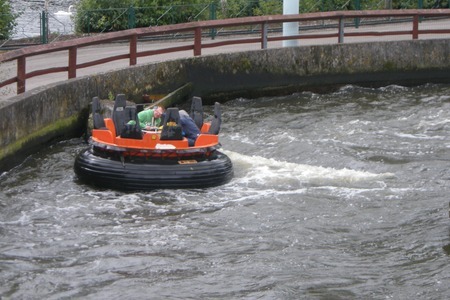 I’m sure that we’ll visit Drayton Manor many more times in the future, as we have always enjoyed our visits there and it’s relatively close to our home. I’m sure that I can look forward to spending more time on the bigger rides when my children grow an extra 40 cm to reach the minimum height for G-Force! This entry was posted on Sunday, September 19th, 2010 and is filed under Babies, Children, Coventry West Midlands, Days Out, Family, Holiday, Tourism. You can follow any responses to this entry through the RSS 2.0 feed. Both comments and pings are currently closed.